Now that two months of hot, dry summer here in Brussels have turned into wet and windy spring, it seems a good moment to try something dark. Hunting through the “to taste” crates, we spot a bottle of ’t IJ IJbok that Bob must have donated to the cause at some point. 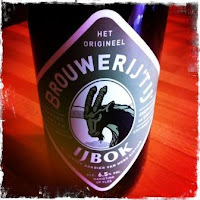 We’ve had a number of very good beers from Brouwerij ’t IJ in Amsterdam in the past but never their IJbok. Surely this is a safe bet. ’t IJ IJbok pours a deep amber with a creamy head. The taste is slightly sweet caramel with notes of roasted tomato and burnt paprika. It evolves in the mouth into a very prominent burnt malt aftertaste, which leaves a lasting bitterness. It’s certainly complex and interesting. I’m not sure I’d rush out to find another bottle, but I’d order it again when I needed a bit of warmth on a gloomy, overcast day.